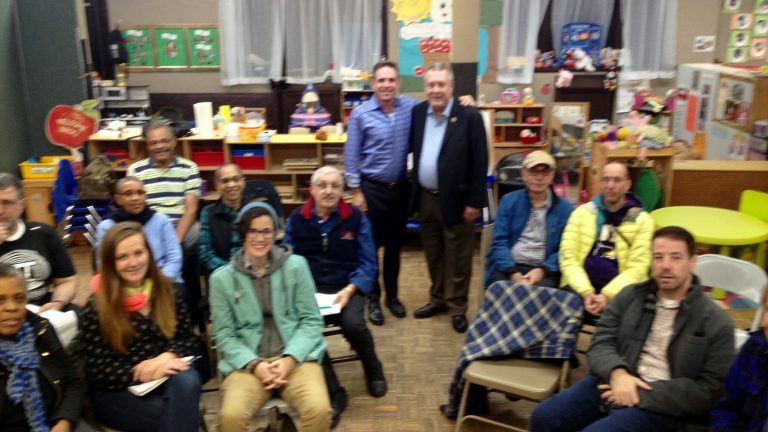 Eric Marcus and Sara Burningham presented excerpts of the Making Gay History podcast at the monthly meeting of the Lesbian & Gay Democratic Club of Queens, New York, which was held at the St. Mark’s Parish House in Jackson Heights. Pictured at the center of the photograph are Eric Marcus (at left), and New York City Council Member Daniel Dromm. Photo credit: Sara Burningham.